Passionate Nintendo fan and friend of Fenix Bazaar Josh goes hands-on with the Nintendo Switch. Editor’s Note: This is Josh’s first published piece for Fenix Bazaar. He attended a special Nintendo Switch event for select fan groups on January 15. Back in October of 2016, the Nintendo Switch was revealed to the world in a short but detailed proof-of-concept video. The handheld-console hybrid, previously codenamed “NX” , was said to have been in development since 2015. As such, it was subject to many different rumours and leaks, including various console and controller designs, patents, and more. 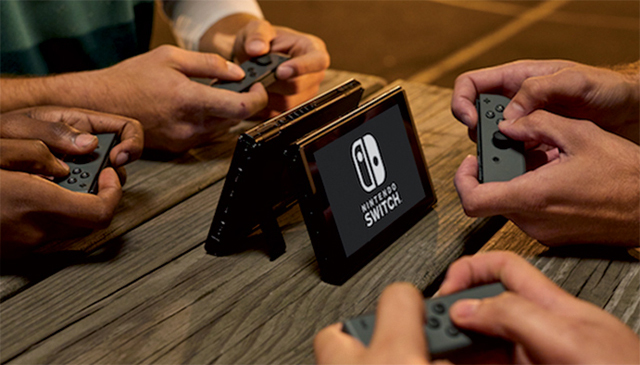 Shortly after its initial reveal, Nintendo offices around the world invited select people to go hand-on with Switch before release. I was fortunate enough to receive an invitation courtesy of Nintendo via the “Nintendo Switch Club Australia Facebook” fan group. On Sunday morning, I made the one hour trip up to Melbourne to attend the Australian premiere of Nintendo’s latest system. Held at the Melbourne Convention and Exhibition Centre, the lucky invitees waited outside a large function room on the second floor, decorated with appropriate Nintendo banners and even display cases housing the company’s home consoles of yesteryear. Once the doors opened, we were greeted by the software sizzle reel video as it was shown during Friday’s presentation, before proceeding past the red wall where we would catch our first glimpse of the Nintendo Switch in person. The console, dock and controllers are, to my surprise, much smaller than expected. I would wager that the final marketing box size would be no larger than that of a 3DS XL or one of those collector’s editions of a game. This being said, it was one thing to look at it and another to hold the system (and the Joy-Cons) itself. Moving past the little display of the Switch and its accessories, we were presented wall-to-wall with upcoming Switch games, with some sections being thematically decorated to suit the software they were promoting. The first one I had come across was ARMS. Being in the company of other attendees from the Facebook group, it was the perfect opportunity to play some multiplayer, which was the encouraged mode at the event for all games, save for the sole single-player experiences like Zelda: Breath Of The Wild. The staff in charge of the ARMS booth were friendly and welcoming, encouraging myself and my friends to step up onto the bigger screen on the center stage of the booth. The attendant handed me two Joy-Cons, and this was the first contact I had with the Nintendo Switch. The two small bits of fortified plastic were fairly weighty. They weren’t exactly heavy, but they weren’t featherweight, either. They felt like slightly lighter, matte versions of the Wiimote. The buttons could be compared to the same size as the ones on each side of a 3DS, analog sticks included. At first, holding one Joy-Con in each hand can come off as a little fidgety, and it’s not just because of one’s hand size. The buttons of a Joy-Con are so strangely located, in the way that there aren’t just buttons on the face and the top, but on the side, too. Sometimes, all of these count towards one’s gameplay experience. 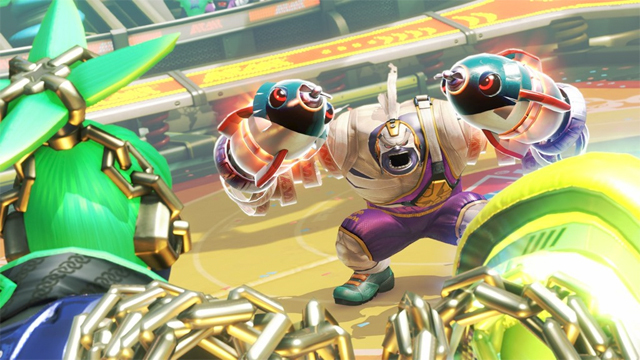 In saying this, I personally think nobody would be able to instantly master a game such as ARMS. The handling of these new and foreign controllers should be mastered before delving into the mechanics of the game itself. Note that there will be other control methods available, such as using the Pro Controller and Joy-Con grip, with both available at launch on March 3. Once you’ve familiarised yourself with the control style, the game more or less turns out to feel like a glorified version of Wii Sports Resort’s Boxing, with added precision and force feedback thanks to the Nintendo Switch’s all new ‘HD Rumble’ feature, which I’ll go into more detail on later. The standard outlook of ARMS is rather simple: you select a colourfully designed character and assumedly a stage (the demo build threw myself and my opponent into a random one each time) before entering a fight. From there, you are able to mix and match your left and right boxing gloves, which have all sorts of gimmicks attached to them, from rockets to sharp-looking chakram. In terms of control, the classic Nintendo motion controls make the player feel right at home, and they’re more accurate than ever, although it’s yet to be seen how well they can hold up for extended periods of game time. I played two matches (both best-out-of-three) against two different friends, and it was a fun experience. That said, I’m questioning the replayability value of this game when it comes to the single-player mode. While gorgeously presented with popping visuals that can only be described as “Nintendo”, the game may truly lose it’s shine quicker than it would without some long-term support from both the fans and the community. Nevertheless, if you’re a fan of Nintendo and their original IPs, this game will make you feel right at home. 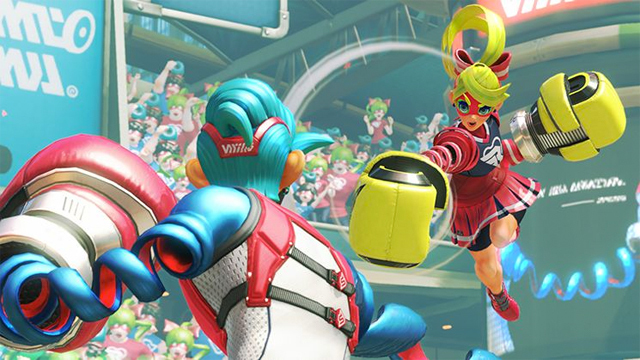 With bright graphics, a decent soundtrack, and plenty of “that Nintendo feel”, ARMS deserves some attention from gamers both new and old. 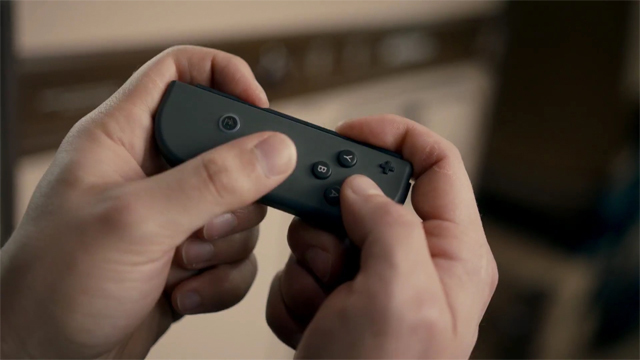 What can easily be described as the tech demo for Nintendo’s new Joy-Con controllers — and what should’ve been a pack in title for the Switch — 1-2-Switch was literally the centrepiece of the event. The booth for this game was constructed as a series of rooms, where people passing by could spectate the players participating in the multitude of mini games 1-2-Switch has to offer. I participated in two of these games, the first one being Samurai Training. We were told to wrap black headbands around our foreheads as if we were getting into character. These games were the best way to show off the HD Rumble feature Nintendo had demonstrated during their stream. The objective of Samurai Training is to physically face your opponent, and watch their movements before they swing their Joy-Con in a downward motion. That’s when you have to clap your hands together, with the Joy-Con in your right hand to block the sword. The game continues until one player misses and is defeated. My match went surprisingly longer than most according to the Nintendo rep on hand. It was the next mini game that truly (albeit awkwardly) showed the potential of the HD Rumble feature: Milk. As it sounds, it was pretty straightforward: players had to milk a cow using the Joy-Cons in a downward motion. Like Samurai Training, the attendant gave us farmer bandanas for that extra bit of immersion. After being run through a small tutorial, we got to try our hand at milking an invisible, virtual cow. I initially had trouble coordinating my left hand to hold the Joy-Con’s triggers (SL and SR, or vice versa depending on the controller you have) with my index finger and ring finger, with my middle resting between them. This is where the HD Rumble really shone. Moving my hand in a downward motion, it was as if I could feel myself actually milking a cow. While one would probably be amazed at how technology had advanced, I was honestly freaking out at the uncanny feeling the feedback was giving me. The representative from Nintendo challenged us to look each other in the eyes while doing it, and it was an intimate experience, to say the very least. Leaving the 1-2-Switch booth, I still had the thought in my head, questioning why this game isn’t packed in with the new console, or even why it’s so expensive at a RRP of $69.95 AUD. This is the perfect party title for the Switch and it does show off it’s unique controllers. 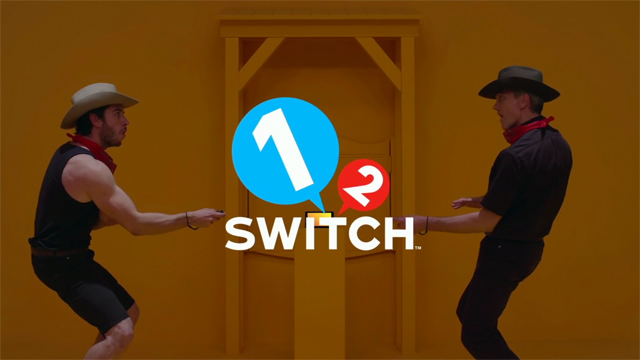 However, if you’re looking at purchasing the system for it’s single player experiences such as Zelda, Mario or even Pokémon, 1-2-Switch probably isn’t for you. By any means, if you have friends or family around often, the game should be of entertaining value and may be worth the pick up. Walking around the secluded but relatively large hall, I came across the corner that housed the sequel to the highly acclaimed Wii U shooter, Splatoon. The booth offered the game in two styles: TV mode or handheld. I was eager to see how Nintendo’s latest console would pull off the home console experience when being used as a portable, and to my great pleasure, it was done to near perfection. Picking up the Switch, console and all for the first time felt as if it was going to be a make or break moment for me, and satisfyingly, it just felt right, with the Joy-Cons attached to the rather crystal clear screen. I came in expecting something along the lines of the Wii U Gamepad, and I was happy to see that wasn’t the case. The upgrade in hardware was significant. The aliasing was definitely smoother, and brought out the characters in a crisp 720p. The Switch screen provides a much more enjoyable viewing experience with it’s higher DPI and resolution than most portable devices, with the exception of high end smartphones. The quality of screen Nintendo has delivered this time around has to be seen in person to be believed. The eight handheld setups were connected to be in a multiplayer battle. When the game started, I spent more time attempting to stress test the Switch in it’s handheld mode, whether it was by moving the camera around rapidly or making sure there’s a lot of paint filled explosions. It was a relief to see that the system hung in there and kept a consistent framerate with it’s high quality visuals. Having dropped out of the original Splatoon long before it’s influx of DLC and ‘Splatfests’, the game feels somewhat different from it’s predecessor. While it’s definitely the same in the sense of core gameplay and mechanics, the new maps, weapons and customisation options — not to mention the ability to play it on the go — gave Splatoon 2 a refreshing aura. It was during this moment where I realised the configuration I’d be keeping my Switch in the most would be it’s handheld mode, and that’d be touched on in the next game I played. 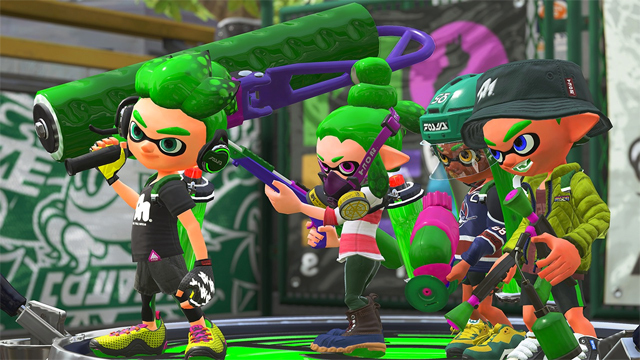 Splatoon 2 delivers that fun kiddy-yet-competitive aesthetic it’s predecessor gave off, and builds upon it with new mechanics, maps, weapons and more. For me, that is more than enough to pass off as a sequel worth purchasing at launch. Editor’s Note: Splatoon 2 is due for release in Q2 2017. Right next to the paintball decorated Splatoon 2 section was a rather modern lounge area that was home to the enhanced and definitive version of Nintendo’s world famous kart racer, Mario Kart 8 Deluxe. The game was offered in four different styles: Pro Controller on the TV; Joy-Cons on the TV; Joy-Cons in the tabletop mode (The screen using it’s kickstand on a table); and, once again, handheld mode. The only one available at the time was the handheld mode and I had no objection to try it again. The tracks were the same, as were the characters with a few new additions: the Inklings, Bowser Jr, Dry Bones and King Boo being revealed. 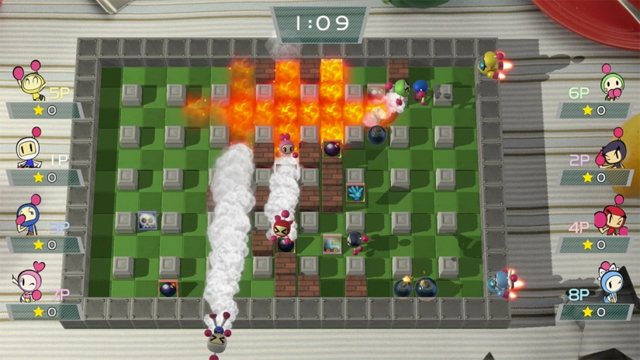 This version of MK8 added the highly popular Balloon Battle mode that was missing on the Wii U counterpart, alongside some returning weapons such as the feather from Super Mario Kart on the SNES, as well as the Boo item. Playing the game in the Switch’s handheld mode was almost identical to playing Mario Kart 8 on the Wii U’s gamepad, or even Mario Kart 7 on the 3DS, except everything was much smoother and definitely crisper. It took a moment to sink in the fact that I was playing such a game of high quality on what can be treated as a portable device. There are subtle graphical upgrades, although they weren’t too significant to note. Everything played at a solid locked 60fps, and experiencing this just solidified my decision to favour the handheld mode the Switch had to offer. Nintendo launching a Mario Kart within just under two months of launch is a powerful move for the system, however it may struggle due to the Switch’s rather high launch price. 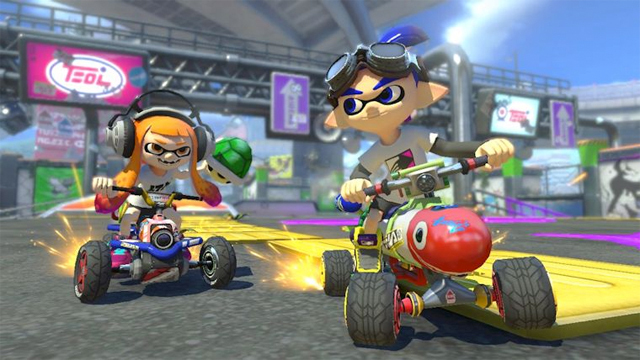 An essential game for the common Nintendo fan, or any Switch owner; whether you’ve got friends or you want to dominate the online scene by yourself, Mario Kart 8 Deluxe will be a prime addition to the growing Switch library. This was by far one of the quickest plays I’ve ever done and even the staff at the small Sonic Mania (just allocated to a single Switch unit) setup thought so, too. I’ve been a long-time Sonic fan, with my first ever game being Sonic 3 on PC. The set-up was only in handheld mode, but like the last two games, I had no issue with it. As soon as I was handed the console, the muscle memory of all those past classic Sonic games kicked in, followed by an intense surge of nostalgia. 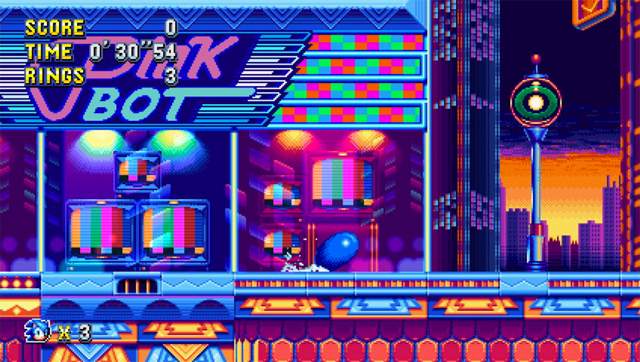 Suffice to say, I’ve been excited for the two Sonic games that are due for this year since their reveal at the Sonic 25th Anniversary livestream, so finally getting to play Sonic Mania was a happy moment for me. Again, the Switch’s screen made the vibrant colours pop and the pixels as sharp as ever. The sound quality from the handheld device was clear, and I could distinguish those Mega Drive-esque instruments from one another. It was as if I was playing Nintendo’s classic Sonic Advance games from the GBA days (which was in fact my first Game Boy Advance game) but in high definition. I knew how to run, jump and spin dash my way through new yet familiar obstacles and enemies as if I’d done so for the last 22 years of my life. The man supervising the unit could tell I was an advanced Sonic player, and in fact I apparently got the ‘record time’ on the new Studiopolis Zone – something under two minutes, although I clearly slowed down at points. The rush of going fast as Sonic had never felt better. It was there when I decided that I’d definitely be purchasing the Switch version of Sonic Mania (also available on PC, Xbox One and PlayStation 4). It’d be identical to the more powerful competition’s iterations, yet it would hold the advantage of being able to be played anytime, anywhere. Fans of Sonic and platformers should definitely pick this one up on any platform possible. Bomberman 64 and Bomberman Hero were two big parts of my childhood, and I was fortunate enough to have a few friends over every now and then to have a blast (no pun intended) on the famous multiplayer mode. This was when I was handed just a Joy-Con remote by itself in the sideways position, while three other friends of mine were handed one too. Without much instruction, we were thrown into the classic style Bomberman map: a large, square shaped arena with blocks and pillars obstructing our paths, with the only way to get through being to blow up the blocks. In exchange, one would sometimes receive power ups to make their explosions larger or even grant them the ability to throw additional bombs, among a few others special abilities. The primary objective was simple and traditional: to take out opposing players. There isn’t much to say about this title. It’s as you’d expect traditional multiplayer Bomberman to be, with updated graphics, sound and a few twists here and there … and that’s exactly the reason I’ve pre-ordered it. With Konami having bought out Hudson, I was uncertain of this video game icon’s future, but now that he’s back in the way he was most remembered, it’s going to be a good time for all. While the experience would be ten times more fun with friends or family, Bomberman can definitely be enjoyed by a single person, especially through its cute and comical story mode. By this time, my two hours at the event had run out, and it was time to leave the venue to make way for the next session of people lucky enough to score an invitation. We were given rather quality gift bags for attending — Nintendo Switch themed, of course. I most certainly walked out wanting to play more of the games I did, and even more so, play the games that I didn’t. Of course I’m talking about The Legend of Zelda: Breath of the Wild. Everyone that knows me knows that Zelda has a very special place in my heart and with the grand story trailer they had revealed at the end of the Friday Switch stream, I’d be naturally itching to get my hands on the game, right? Well, true as that might be, unfortunately, the line to play the anticipated title was cut short due to time, and as one would have it, it was the most popular game there. Be that as it may, the full launch of the title is less than seven weeks away, and I felt I could stomach the wait, whetting my appetite with bits and pieces of trailers and gameplay on YouTube. I know for without a doubt that this game will be phenomenal, and it’s only a matter of time before it makes that fact known to the world. March 3, hurry up! The Switch is making itself out to be a promising little console packed with enough power to raise eyebrows, especially considering it’s a Nintendo system. While the price of AU$469.95 RRP has put many off purchasing it at launch, the tried and true fans of the company all around the world have emptied their wallets to pre-order the Switch along with its small but definitely effective number of launch titles. I myself am eagerly awaiting the newest entry in the Zelda series, alongside the latest Nintendo console. I had already or-ordered the Switch, but that one event I was lucky enough to attend felt like it justified my purchase-to-be. 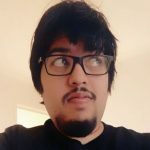 Josh was born and raised as a Nintendo fan, but isn’t afraid to step into the alien worlds of the Sony and PC gaming scene. In fact, his favourite series is Persona, yet he would drop everything for Zelda. He secretly enjoys watching Japanese dramas while he designs and draws characters, just 'cause.